Rarely Defined: Lumbar Shunt Catheter out of place; A revision (surgery) scheduled. Heart Procedure as well. 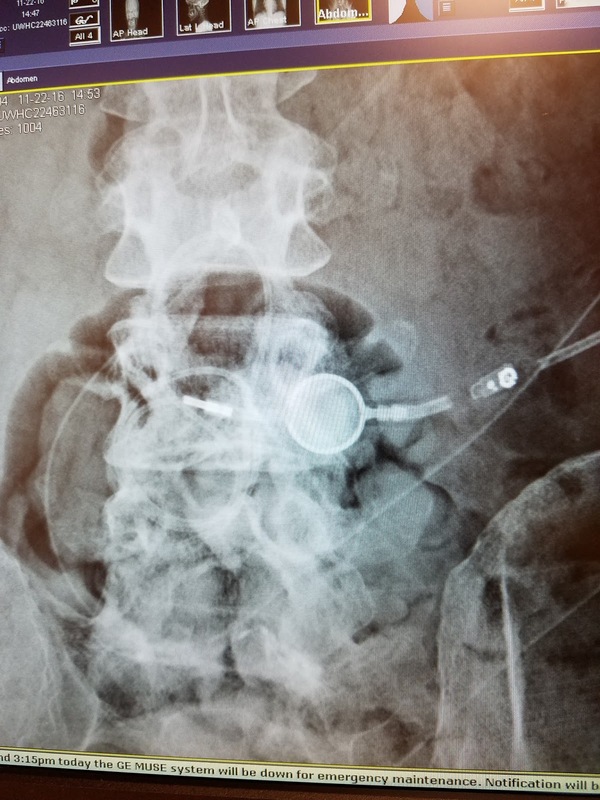 Lumbar Shunt Catheter out of place; A revision (surgery) scheduled. Heart Procedure as well. The LP (Low back) Shunt catheter out of place/wound up and a mess - see 2nd pic for what it should look like. Xray done right after the last surgery, shunt replaced. 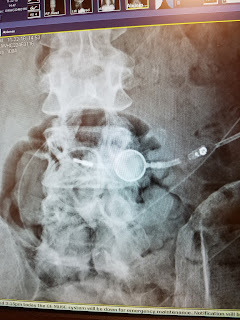 I followed up with my Neurosurgeon a few days ago; I had emailed him last wk to ask if we could do a Xray of the LP Shunt mainly; I just wanted to make sure it was ok as I've suspected/wondered since I was released from UW a little over a month ago if there wasn't a problem somewhere along the shunt catheter. He left it up to me when to do the shunt revision but we'll have to go back in and re-position this catheter just a matter of when. Given I have the Heart Ablation procedure in 2wks and headaches are pretty well under control (thanks to the spinal fluid leak in my low back) i've opted to wait until after the Holidays (or after Christmas anyways, the surgery is scheduled for Dec 30th). He feels the fluid (CSF) leak is being caused by the out of place catheter and there having been such a wider area that was opened in my spine in this last surgery. I guess if nothing else in all this that extra, intermittent CSF drainage has been pretty good for headaches and helped appetite some! The leak and catheter issue likely occurred due to the bone removal (laminectomy) that was done and is likely a big reason behind the catheter being worked it's way out of place (due to a much larger area is created/opened up in the spine) in the same location the shunt cathether then gets tunneled in and sits (in the above Xray if you look closely you can see the catheter originally was tunneled a fair ways up my spine within the Cerebral Spinal Fluid, likely originally sitting in the upper lumbar space or thoracic (mid-spine) space but I think Dr.Iskandar said he didn't anchor it or maybe it was a single suture used to anchor the catheter in place I can't remember for sure but whatever he did I don't think is unusual. 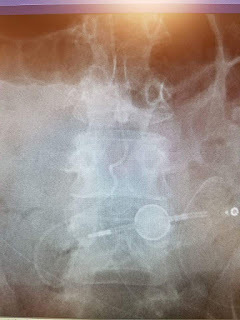 For whatever reason in MPS Pts we tend to have issues with devices moving and coming out of place so that + the larger opening in the bone = the catheter was able to back it's way out of the proper location and is now a curled up mess of sorts (a catheter shouldn't have loops much less so many loops to it when within the spine apparently). I asked if we could move the reservoir and valve which is programmable (simply means there are multiple settings on the shunt valve (a Codman Hakim valve) and these can be adjusted to allow for more or less CSF drainage. In my case we turn both valves down to the very lowest setting ='ing max amount of CSF (spinal fluid) can be drained. It would unfortunately have been an easier surgery had I opted to keep the valve/reservoir sitting where it is now, sitting on my back within the shunt line but honestly it is SOOOOO much easier to access (again think of like a Port device, which many of us have for our IV Infusions) when the reservoir and valve sit within the shunt but on my side. vs where it is now on my low back. I know this means they have to change positioning on the table and re-drape but having thought about it more on my drive back from the Appt., I just feel like if we're already having to do this surgery due to the catheter being out of place I want to maximize the best potential for things to go well/not be anything that could cause irritation! - As far as if or should anything worsen between now and the end of the month i'll just let Dr.Iskandar and his Team know as instructed and we'd make decisions from there. God willing nothing will though! Otherwise I have the Cardiac (Heart) Procedure already scheduled for Mid-Dec. (Dec 14th), this is just a 1 night stay though and same Anesthesia dr. i've had for all 3 Open Heart surgeries and the other 3 or 4 Heart procedures I've had. Same Heart Rhythm dr doing the procedure (Dr.Kovach so it should go smooth. The biggest thing is really b/c it's the sinus node we're trying to slow down Dr.Kovach said this area of the heart is pretty notoriously hard to ablate or for an ablation to last long term. It's quite possible we could have a successful procedure (as we did the last time this was done, back in summer, where it lasted for about 12 hrs) but then have to repeat the procedure intermittently down the road. My Heart Team's concern though is the mitral valve changes and is the overly fast heart rate causing these changes so we need to do something as meds aren't working (to slow rate) despite being on multiple different medication classes. Any risks are over shadowed by increased damage to the new valve so we do what we have to. Thankfully it is the same Anesthesia (for airway) dr. which helps. Both I and my Heart Rhythm dr. asked her if she'd be willing to do the procedure and so scheduling was coordinated with what worked for her as well. Be grateful for the small things, right? Pre-Op for the Shunt revision is scheduled next Weds with my Primary Dr., in Madison. She's great about working with Cardiology where needed or with Neurosurgery if needed so should go fairly smooth. Blood thinner wise unless she/Cardiology suggest otherwise i'll follow the plan put together between Dr.Iskandar (Neurosurgery) and my Cardiology Team for pre-surgery and the Lovenox. I've been on lovenox twice daily (vs oral Coumadin) since the 3rd heart surgery last Jan., so atleast if nothing else INR isn't an issue i'll have to figure out. At some point per my Cardiologist we'll go back on the Coumadin but for now Lovenox works while we con't to settle out the on-going shunt stuff and this upcoming heart procedure. As a side note I have to say even though it's pretty painful with virtually any activity (being on my feet, going to the store, teaching SS, sitting I move positions constantly, etc) atleast my headaches are fairly good yet thanks to the spinal fluid (CSF) leak in my low back! This leak occurring most likely b/c of the catheter being out of place.